This is a topic that has been debated by physical therapists, athletic trainers, strength trainers, and pitching coaches for years. There have been several research articles written about the topic, the most recent of which, the “Effect of a 6-week weighted baseball throwing program on pitch velocity, pitching arm biomechanics, passive range of motion, and injury rates”, written by Mike Reinold, PT, DPT and Dr James Andrews sheds some interesting light on the subject. Since all players are desperately trying to throw harder, there are many programs, web sites, and theories out there that have tried to find the secret. 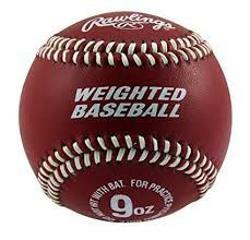 One such theory is that throwing a heavier ball will strengthen the arm and then allow the player to throw a standard weight baseball even harder. The research on this has been mixed at best. This recent study cited above compared 2 groups of teenager baseball players that threw weighted balls in addition to strengthening and routine baseball activities with another that threw only standard weight baseballs. 80% of those in the weighted ball group increased their velocity by 3%, while 8% showed no change, and 12% actually decreased their velocity. 67% in the control group showed an increase in velocity with 19% showing no change, and 14% showing a decrease. The increased velocity is likely attributed to an increase in shoulder mobility (4’) into external rotation (cocked position) which allowed for improved wind up. The weighted ball group actually showed a decrease in shoulder strength compared to the control group that showed an increase in strength throughout the 6 weeks. Of most significance was that the 24% of those in the weighted ball group sustained elbow injuries either during the study or in the season immediately following. So what does this all mean? The percent of players that increased their velocity with weighted balls over the control group (13%) was less than the number of players who were injured with the weighted ball program. So how does a player throw harder? The answer is to learn to better use the entire body. The legs produce the force, the trunk transfers the force, and the arm just delivers the ball. Therefore, the stronger the lower half and the more stable the trunk and core, the harder that a player will throw. There is no secret weapon out there that substitutes for a stronger kinetic chain and proper throwing mechanics. In addition, some of the tools that players use may actually lead to an increased risk of injury.